Monster Hunter Tri | I heard you liked music in anime and video games! 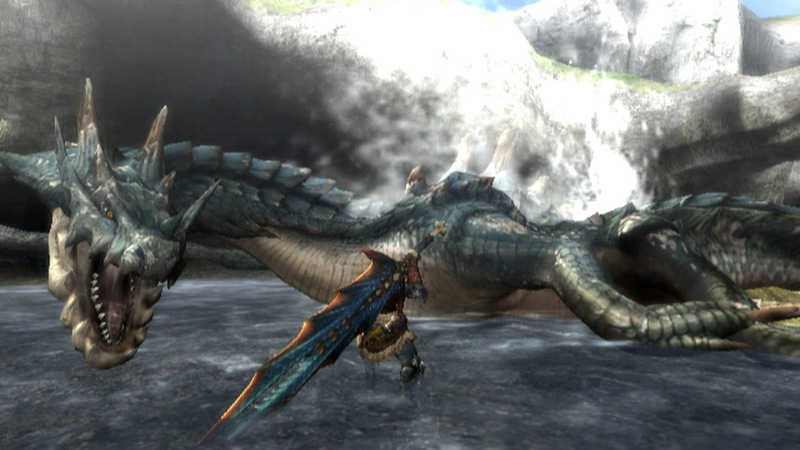 The music in Monster Hunter Tri creates appropriate atmospheres for each of the unique areas where the monsters live. For example, whenever a hunter encounters a large hostile creature in the desert, the music changes from calm and serene to rhythmic, energetic song filled with drums. The overall effect is to create a slight sense of urgency that goads the hunter to either kill the intruder or flee the area. A few of the more powerful monsters have their own themes, differentiating themselves from the majority. This thing is almost 160 feet long, and you fight it underwater. Good luck! 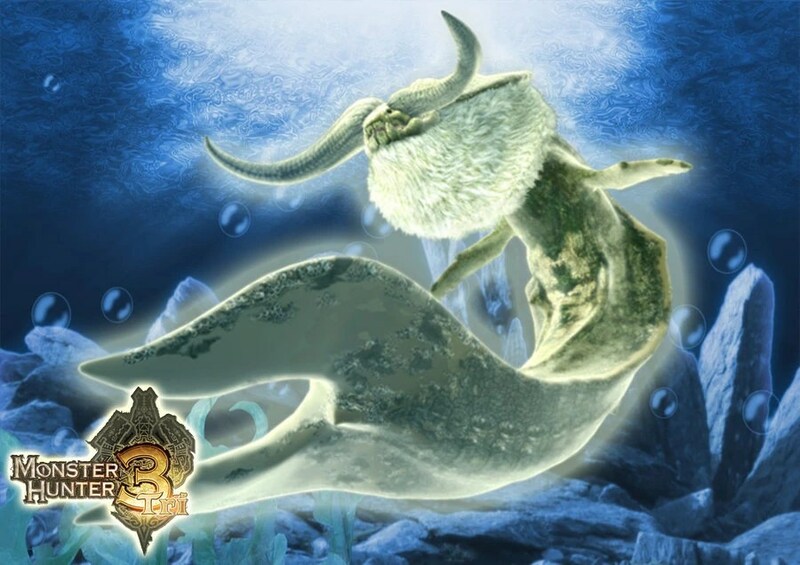 The final “boss” that the hunter faces in Single Player mode is a gigantic, whale-like elder dragon called a Ceadeus. Estimated at over 160 feet long, this gargantuan creature has one of the best songs in the entire game. Composed by Yuko Komiyama, “Moonquake” features a moderately paced song with prominent drums, occasional chimes and chanting in an unidentifiable language culminating in a “tribal” feel. This feeling combines with the importance of the quest and the enormity of the creature, creating an intense sense of anticipation. However, the Ceadeus is not the most feared monster; that title most likely belongs to the Deviljho, a huge black crocodilian beast with an insatiable hunger for flesh. Dreaded by most hunters, the Deviljho has an appropriately terrifying theme. Described by a Youtube commenter as “a cross between Psycho, Jaws, and Godzilla,” Yuko Komiyama expertly composed this piece to unnerve every hunter new to fighting this monstrosity. Large sections of brass instruments are played, inducing a state of anxiety in most people unfamiliar to this theme. Percussion adds another layer to the urgency, melding together to create a powerful, frightening song. I personally am terrified of the Deviljho, mostly due to its theme. Another unique feature about the song is that it replaces any other theme that was playing before the Deviljho appeared; making sure that its presence is known to every hunter in the vicinity. You don’t even reach its ankle, and you have to kill it. Not much information can be found on Yuko Komiyama, one of several composers for the Monster Hunter series. She was instructed in music from an early age, leading her to a great appreciation of all types of music. She has worked on the Monster Hunter games since 2005, but mostly on the spectacular background music. Komiyama also worked on a couple Mega Man albums before she worked with Capcom on Monster Hunter. Without her fantastic music, Monster Hunter Tri could not have been nearly as enthralling as it is now. The difference in music definitely adds to the thematic elements of each boss character and the urgency connected with those characters. I can allude to the Castlevania videogames. In Castlevania, the entire game is played in one giant map divided into various subsections that can be moved to seamlessly. The different visual elements of the subsections alongside their varied difficulties changes parallel to the soundtrack.